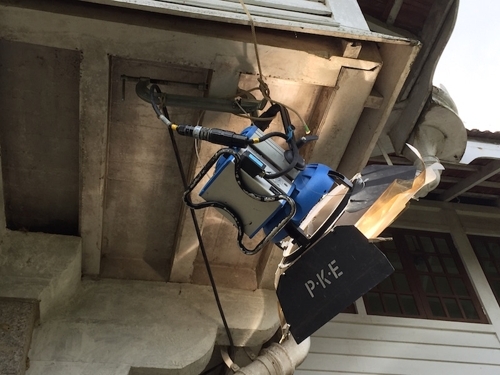 The joists that run across ceilings inside and out in Penang's traditional colonial houses make the rigging of large lamps very easy. You can see how neatly the electricians were able to tuck away a couple of Arri M18s. Normally this type of rig would require substantial scaffolding and wall braces. Truth be told it would most likely not even be possible to hang lights of this size from a normal ceiling. A large G clamp is all that was necessary here. 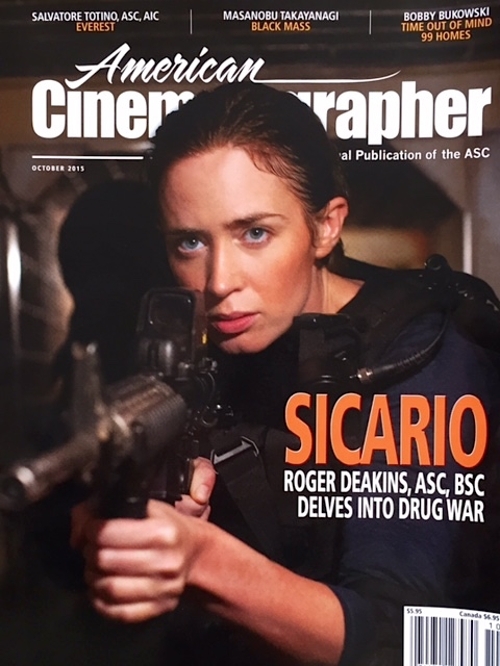 American Cinematographer Magazine has published an article on my contribution to the making of 'Critical' in the October 2015 edition. Please click on the issue cover image below to read on. 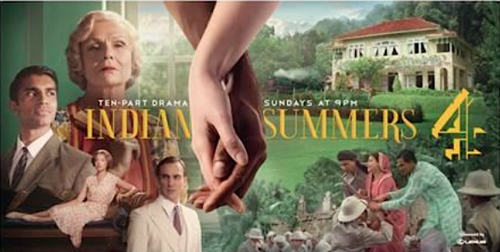 I owe John de Borman BSC a huge debt of gratitude for setting up series two of Indian Summers so immaculately. 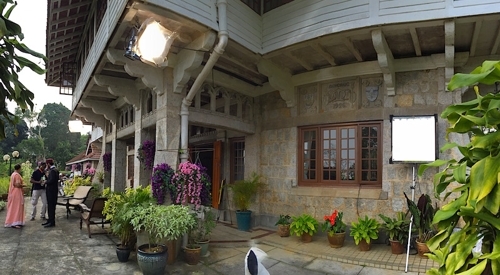 It has made my job as an incoming DoP an utter delight. 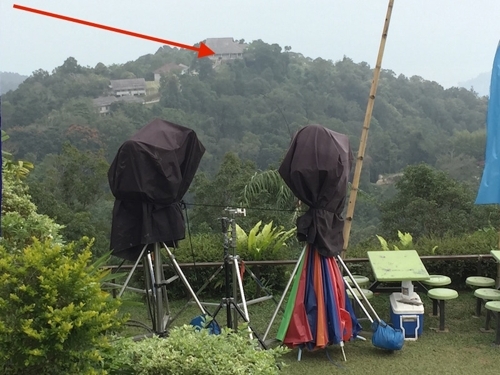 Anyway, in John's preproduction, gaffer Sham Ahmad was sure that the old Crag Hotel (standing in for the Simla Club) could be lit with two 9kw Arri M90s from the terrace of the Bellevue Hotel atop Penang Hill - about a quarter of a mile away from the location across a valley. The story goes that John remained somewhat unconvinced and bet Sham 100 Malaysian Ringit that this would not be possible. Sorry you lost the bet John but I hope you'll agree that your pecuniary loss came at both of our creative gain. The lighting opportunities presented by being able to set a back light so far away are astonishing, especially with the misty weather that prevails at that altitude. As I'm sure you did, I threw a lighting balloon in for good measure. 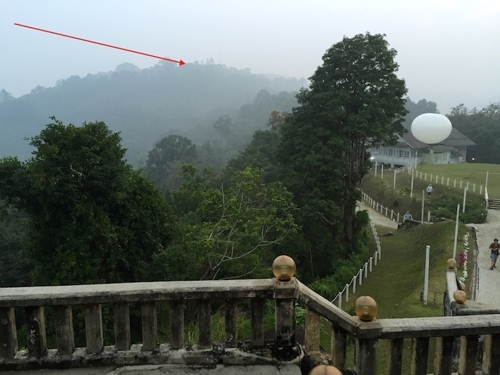 In the first picture the red arrow points to the location from the vantage point of the lamp position. 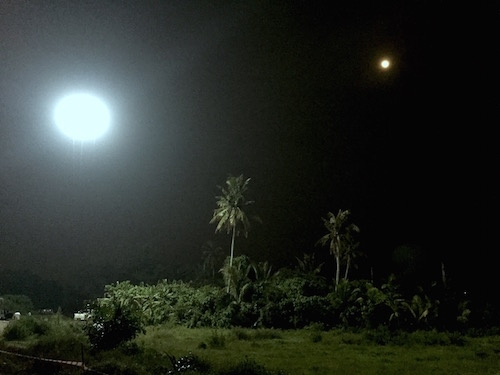 The second picture shows the view from the club up to the top of the hill where the lamps are placed (red arrow). 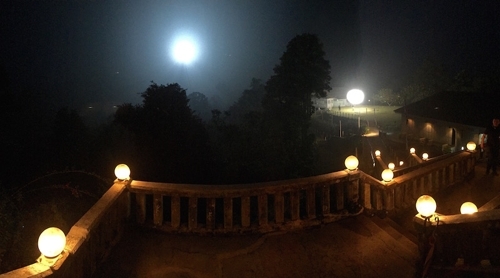 Subsequent images show the effect of the lighting and the back lit mist. 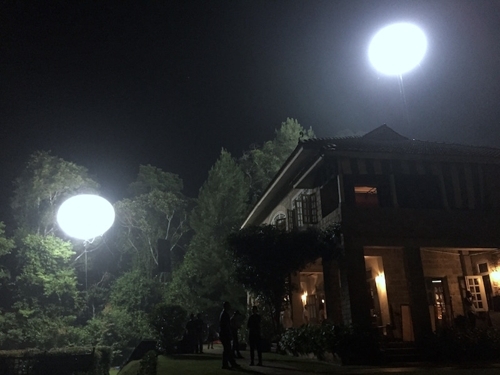 For day and night interiors in the same location we used an Arri M90 bounced into a 12'x12' Ultrabounce for day and then exactly the same setup for night. The only change to the night lighting was to add 1.2 ND to the M90 and move the Ultrabounce a little further away. A quick fix to turn daylight into moonlight. 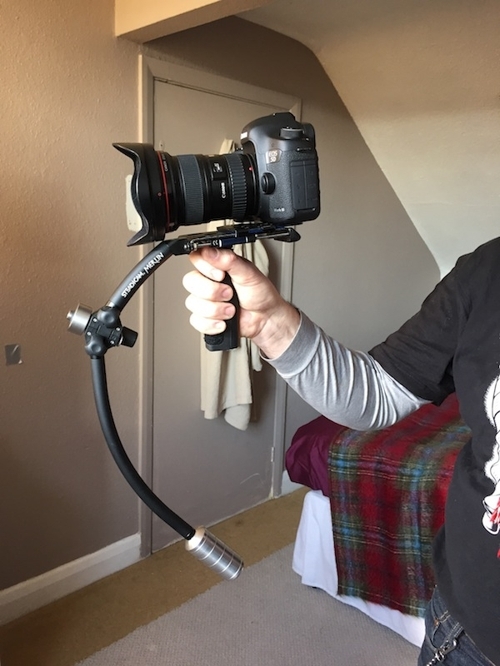 A simple rig but really effective in creating a dynamic tracking shot that began in the garden and finished by jibbing down over the precipice on the other side of the fence. Without a remote head it was not possible to operate the camera so the head was locked off. 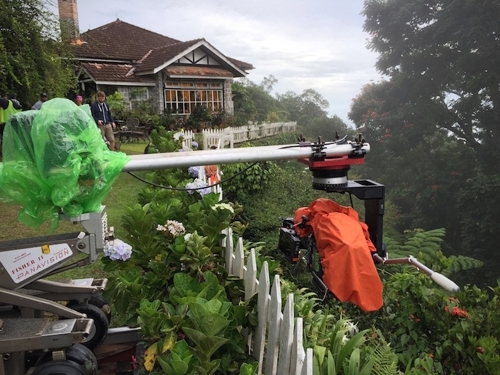 It was up to grip Steve Knipe to find the perfect composition by pushing the dolly, operating the jib and most importantly of all avoiding taking out the white picket fence! The camera was set to clear the fence by millimetres on its way over. Assistant grip Sekar Veerappan keeps a watchful eye on proceedings. The scene started in the shade but thanks to Sun Seeker and unusually consistent weather, I knew that the set would be in full sun by the time we arrived at the close ups. 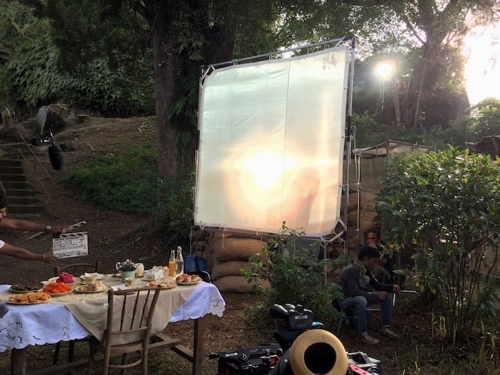 What began with an Arri M90 for a clean back light ended with the sun, the M90 and an M18 all through the same 8' x 8' Quarter Grid. We just about got away with it. 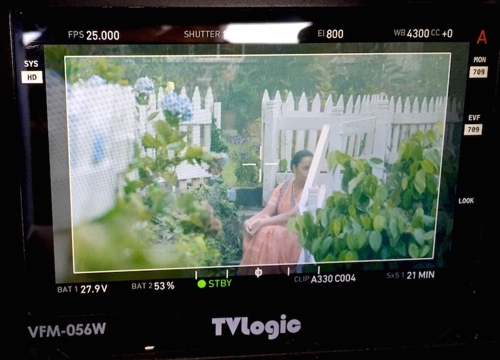 Focus puller Justin Brokensha and a willing background artist sit in. For a shot that required tracking along the wall, it meant getting the camera as close to the wall as physically possible. The width of the O'Connor head pushed the camera too far away. 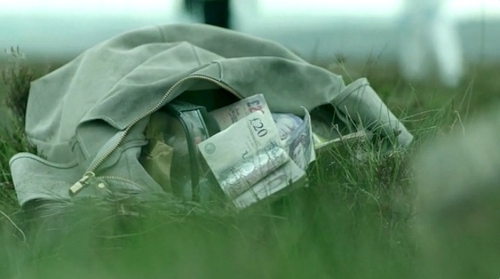 I had done the exact same shot before with camera operator Jamie Harcourt. He used his 'Z' Plate to offset the camera laterally from the head and luckily I had a picture of Jamie's device in action (see below) to show our ever resourceful grip Steve Knipe. Admittedly Steve is not too proud of his work but to be fair he managed to rustle this up in less than twenty minutes. 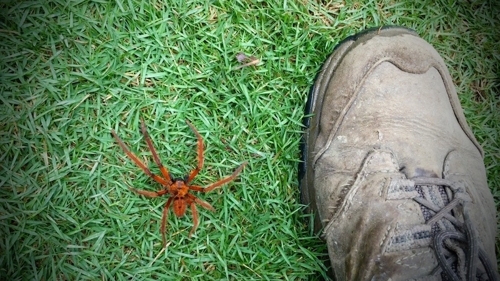 It took the weight of the camera (sort of) and the shot worked a treat. Thank you Steve! I love a really high soft bounce at night in order to add a faint amount of texture to the shadows. It's always a struggle to get the poly board high enough and secure enough and it's not a pretty sight seeing electricians grapple with poly holders on a High-Roller stand. Gaffer Sham Ahmad once again came up with an ingenious solution. He took one arm of a 12x12 frame to which he affixed the poly. The arm slots into a jumbo knuckle atop an Easi-Lift stand. Not only does that now get the bounce up to nearly 30' but the arm can boom up and down to create the perfect bounce angle. It is simple, light and manoeverable. Uh-oh, look who'd found a cosy spot in the grips box overnight, nicely camouflaged with the pags. 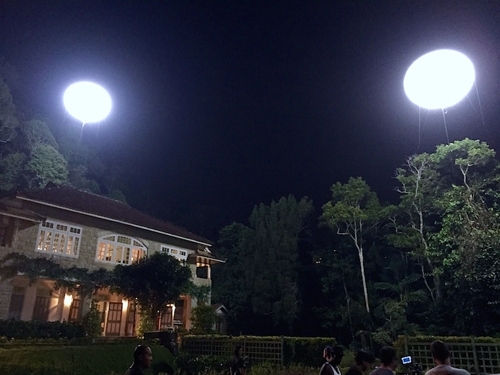 The two lighting balloons have proven invaluable during the past week of night shoots. 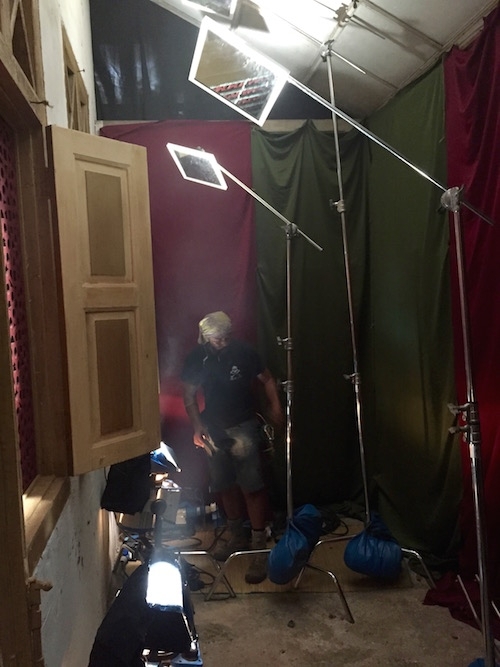 They are incredibly quick to set up and having two of them enables us to maintain a back light and fill at all times without cluttering up the floor. On a turnaround, the technicians can pull each one across to any corner of the garden or behind the house literally in minutes. 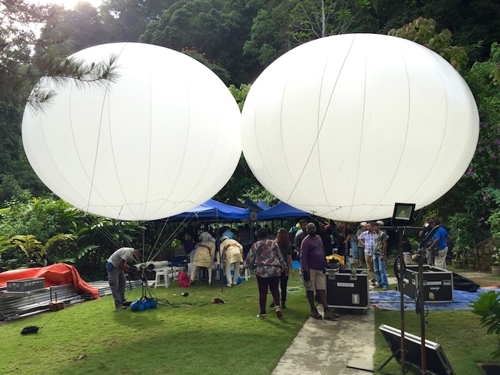 The larger balloon is a 6kw version and the smaller, a 4.8kw. At 800 asa the two in combination deliver a consistent stop of T2.3. Fortunately the wind never picked up all week. Here you can see some of the different configurations followed by a frame showing the final exposure. At cinematography school the first thing it says in the book is that moonlight is blue. It always has been blue; it always will be blue and cinematographers must take appropriate blue filtering action to make it so. So what's going on here? I can only surmise that it never said anything about Indonesian forest fires in the aforementioned text book. 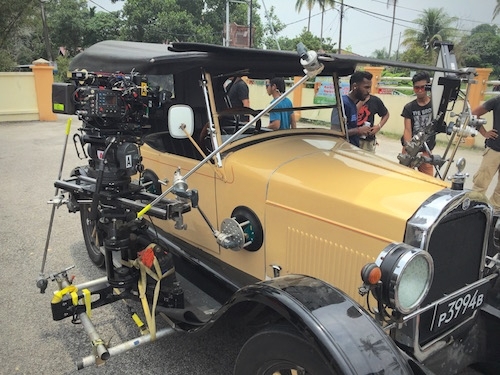 Ever resourceful key grip Suri Ramasamy came up with this neat rig to offset the camera far enough out from the side of the vehicle to get a useful shot into the car without having to resort to extremely wide lenses. 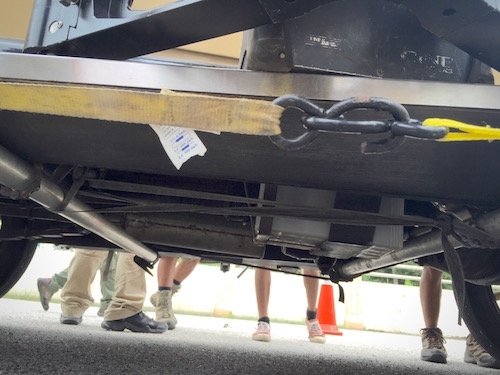 See how the tubes tied off under the car allow the car itself to be used as a counterweight. 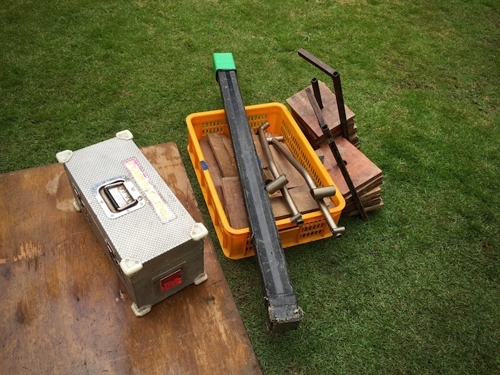 Similarly, gaffer Sham Ahmad, clearly a meccano child prodigy, devised the sturdy fixing for the Kino Flo Celeb 200 (the only light used and no generator power required). Note the inverter setup to power the Celeb off a battery. 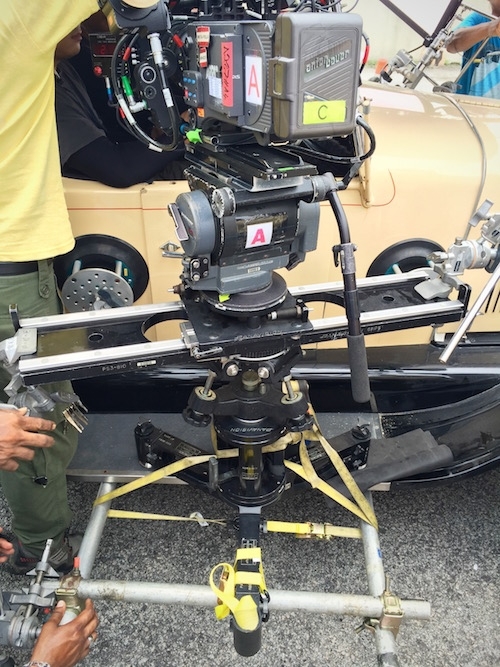 Steadicam/B Camera operator Barney Davis is operating the camera on the tracking vehicle. 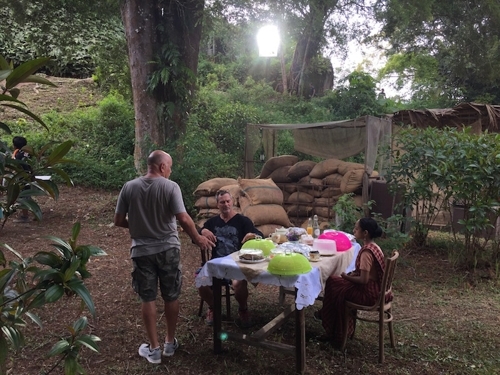 The rainy season is well and truly upon us but when the sun shines, as it usually does first thing in the morning, and we are ready for a big wide shot, the set looks breathtaking. Hats off to production designer Nicole Northridge and her able crew of art directors and standbys. 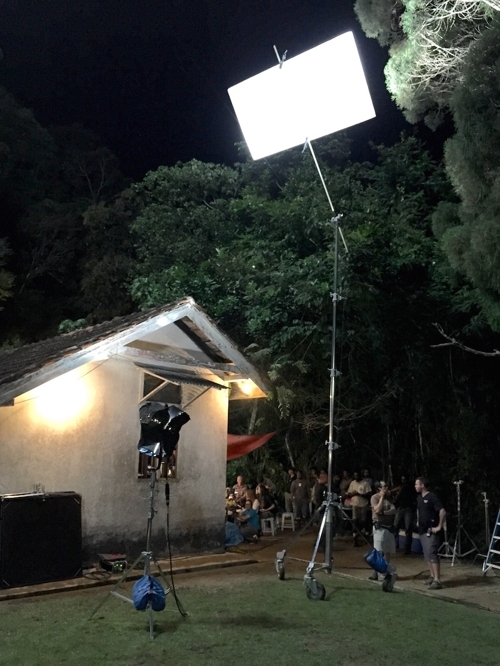 The hallmark of a good lighting crew is the initiative shown by the electricians. Team leader Sham Ahmad ensures that whenever a big bounce goes up, all the necessary flags go up with it. 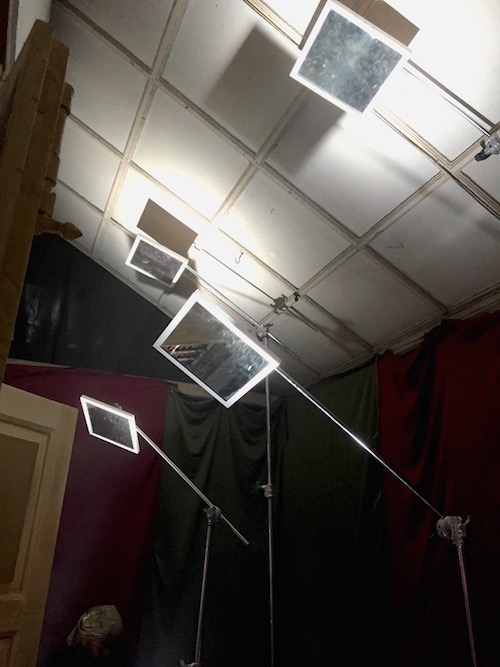 With Sham and his crew, bouncing light on a set with light coloured walls is never a problem or time consuming because the flagging is automatic. How liberating! Mirrors have been put to good use for lighting some of the smaller spaces. 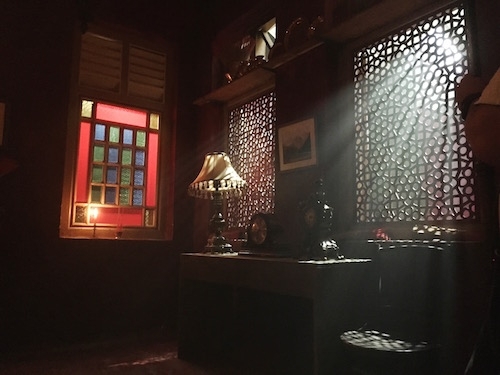 They work best when the light is broken up into narrow shafts by window bars, arabesque screens etc... Here ace gaffer Sham Ahmad sets the precise beam angle. 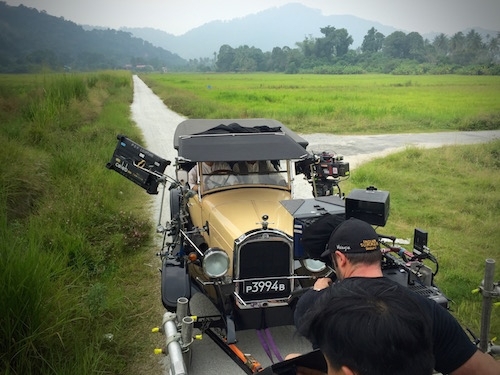 It's been a wonderful summer but time to go back to work - admittedly in the stunning surroundings of Penang, Malaysia to film the last four episodes of 'Indian Summers 2' with director Paul Wilmshurst. 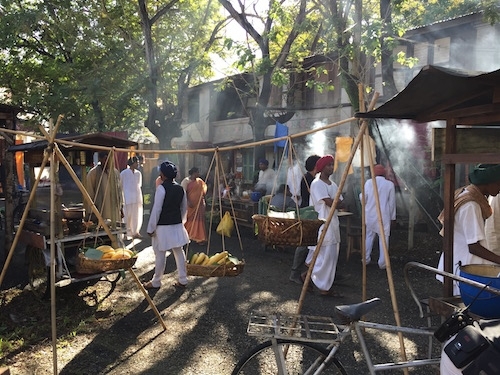 Tomorrow is the first day's filming and no doubt there will be much to report from the set over the coming months. Finally found a practical alternative to the ubiquitous big HMI from the front on a low loader. It's always preferable to light more softly from the side but traditional Kino Flos rattled around too much; Image 80s/Vista Beams/Diva Lights were too unwieldy; the Soft Sun was perfect but it was rare, expensive and unreliable. Enter Kino Flo's LED Celeb 200. It has been around for a while but is the perfect lamp for this application. It is small enough to rig safely, powerful enough to balance a sunny exterior, dimmable and colour changeable. With the wind gusting up to 40mph on the moors above the Durham dales, gyros were employed to excellent effect on the Steadicam. In addition a portable California Sun Bounce Wind Killer was carried behind the operator. It is always heartening to see a piece of precision engineering still being manufactured in the USA. These particular gyros are used to stabilise the image viewed through the periscope on US Navy submarines; another piece of military hardware (dollies were originally used to load warheads onto bombers) to find an application in the film industry. Director Marek Losey asked for a circular track around principal artist Brenda Blethyn in a very confined space - a 5' wide corridor. That's not the end of it. He expressly required that the camera stay exactly the same distance from her throughout the move. Geometrically this meant that the camera had to proscribe a perfect arc. Boarding out the space and tracking on a dance floor would not have worked as inevitably this would have placed the camera at different distances from the pivot point over the course of the move. The narrowest circle of commonly available curved track has a 9' inner diameter, which would have been too wide. What to do? 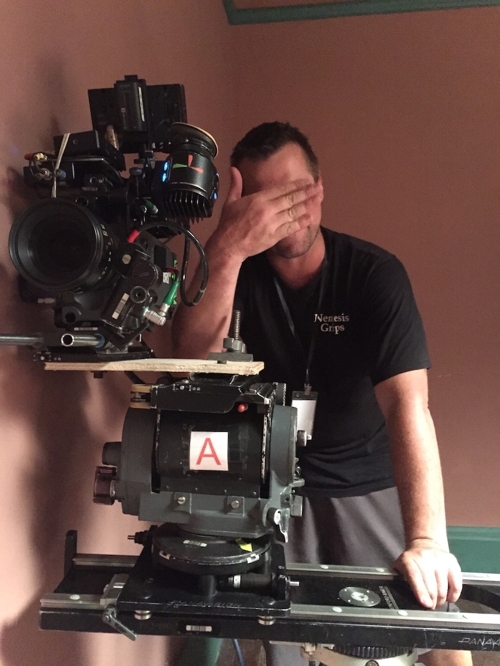 I was all out of ideas but thankfully key grip Craig Shiels, ably supported by his son Aaron, came up with the most ingenious solution. You have to watch the video below which shows the process from work in progress to the shot we made today. Craig devised a turntable rig that kept the camera equidistant from Ms. Blethyn through the course of the move. But that's still not the end of it! Marek asked that the camera move 90 degrees around her and then that she dismount the rig and walk away - but to make it look as if she was standing the whole time and then that she walked away. You can see from the photos the elaborate configuration of apple boxes required to make it look like she was not 'stepping off' anything. 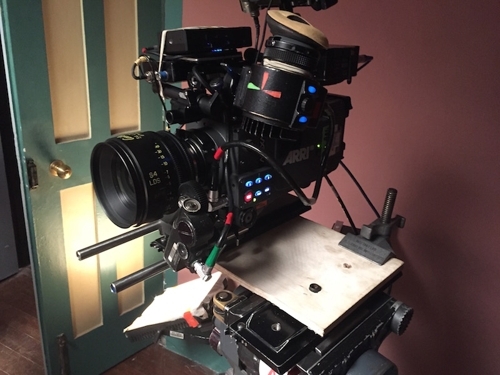 This also meant that for every take the camera had to be lined up perfectly to 'proscribe the arc' but then at the 90 deg stepping off point I had to unlock the pan and tilt and continue the move as a conventionally operated shot. 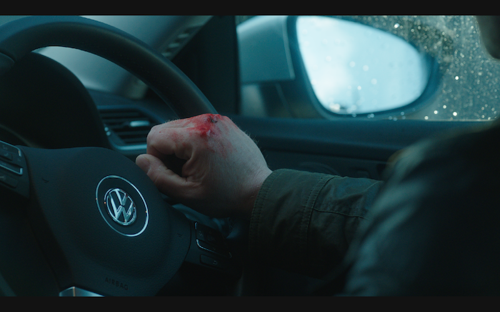 Each take required a substantial amount of reset time and thankfully we got it in three takes. Needless to say the shot worked a treat. Thank you Craig!! This is what filmmaking is all about. Here's proud father Craig with his creation - note the stepped down series of apple boxes - and then Aaron and clapper loader Andrew Binns giving it a test drive. Finally a closer shot of the mechanism. Filming a cycle race in the North Pennines above Weardale, Co. Durham. 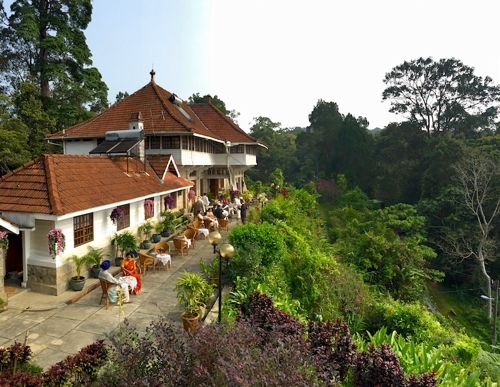 The landscape is breathtaking. Two cameras rigged on the quad, one locked off and the other operated by your humble scribe in his silly hat. The chin strap keeps it firmly in place in the 40-50 mph gusts we were experiencing. Don't quote me on it but I believe that at this latitude this is the highest point between the Irish Sea and the North Sea and there are no natural windbreaks whatsoever in these hills. I wish I could show you the whole shot because it is a very cool shot but that would be giving too much story away. This frame shows how indispensable a low angle prism can be when you need to get really low. Underslung would not get you anywhere near here because the height of the base plate plus the height difference between the lens and camera base would raise the the optical centre a good 3" above ground level. 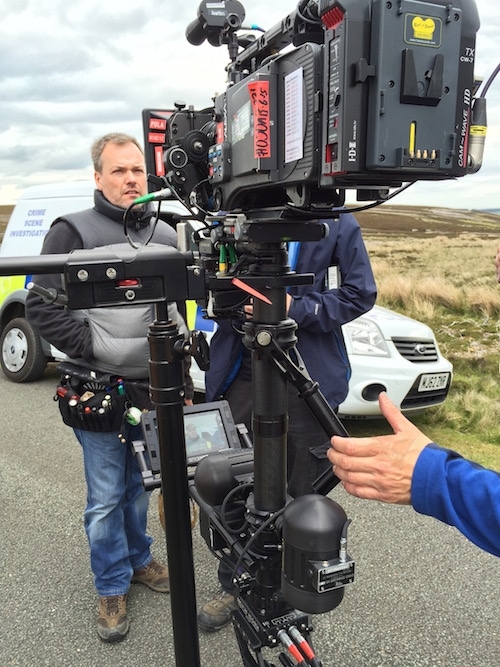 By camera are focus puller Steve Smith and grip Craig Shiels. Good use of the 5D and a very neat solution to rigging the camera in a position that puts the lens as close to the car bodywork as possible. 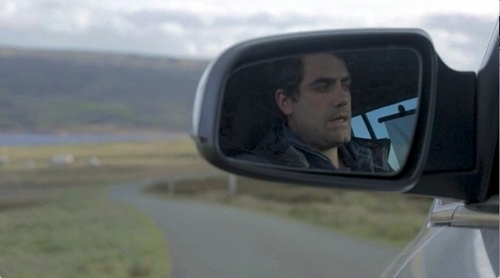 This enabled us to achieve a shot of the passenger in the wing mirror looking out of the window - an important narrative point. 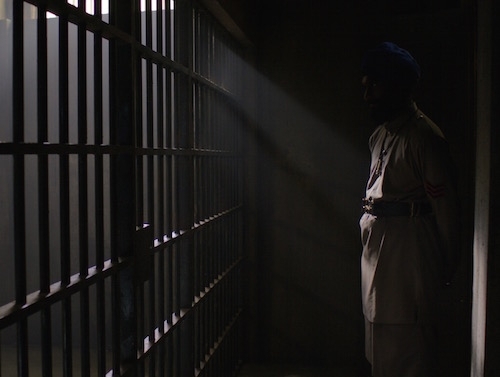 It is always very satisfying to tell the story in one simple shot. Key grip Craig Shiels devised the rig. 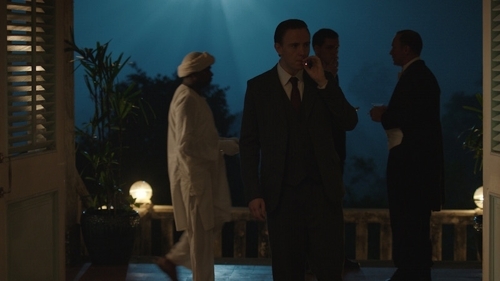 For a night interior scene in a rather splendid location it seemed a waste of production value to black out the windows. Best boy Paul Bates expertly affixed 30 points of ND onto the windows. That's two layers of 1.2 and a layer of 0.6 ND. It was blazing sunshine outside and the ND turned sunlight into moonlight, admittedly without any streetlight or light in windows. Well you can't have everything! Here's how the set looked with the gelled windows and a short clip of the sparks taking it all down. Time to leave this magical place. 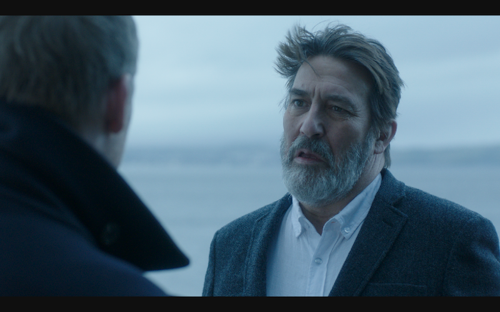 Director Thaddeus O'Sullivan looks wistfully out to sea. No traffic to worry about here. 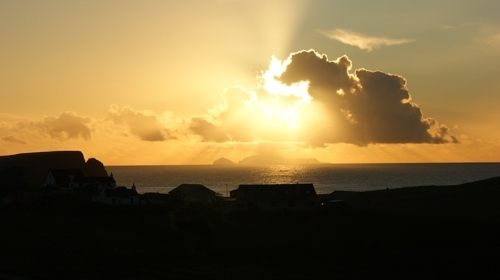 As seen from the Shetland mainland, the mystical island of Foula made famous in Michael Powell's 1937 masterpiece, 'The Edge of the World'. 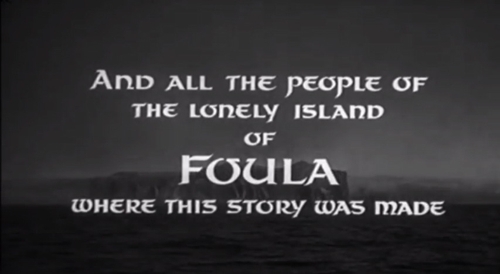 Home to a permanent population of approximately thirty inhabitants, Foula still remains one of the most remote and inaccessible places in the British Isles. Powell shipped a whole film crew there to make his film in the late 1930s. ...has landed on St Ninian's. No, not Rodrigo. Another fine day for a crane shot. 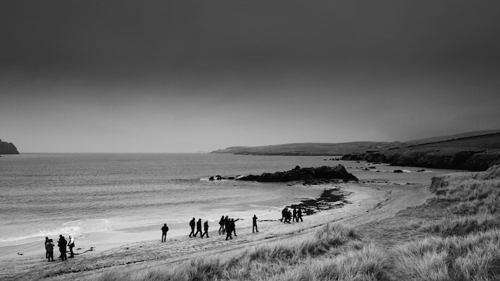 This time over the famous sand tombolo at St Ninian's Isle. Spoiled by the fine weather again. When we recced Eshaness the wind was gusting at 60mph+. Not only were we foolhardy enough to gamble on the drone but we reckoned we'd take a chance on a crane. We're not talking a Titan crane with a gyro stabilised Libra head but a wispy GF-16 and rinky dink Aurora head. Surely it would all end in disaster, a huge waste of money and a very embarrassed likely to be fired director of photography. Luckily not! Conditions could not have been more benign. 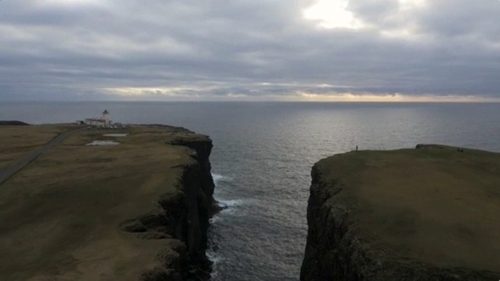 For a sequence on the clifftops of Eshaness in Shetland, a drone was used to excellent effect. The wind gods must have been smiling on us because over the two days that we were filming in Eshaness the conditions were perfect for flying. We always knew that we were taking a big punt attempting to fly a drone there but it was a gamble we were prepared to take. Thankfully it paid dividends as the drone, in the extremely capable hands of Peter Maughan and Iain White from Scottish company Skypod Aerial Media, delivered more fantastic material than we could have ever dreamed of capturing - even rock solid plate shots!! Here's the rig - 4K Lumix GH4 - and a grab from one of the shots. Looks lovely here doesn't it? Don't be fooled. The wind is gusting at 30 mph+. 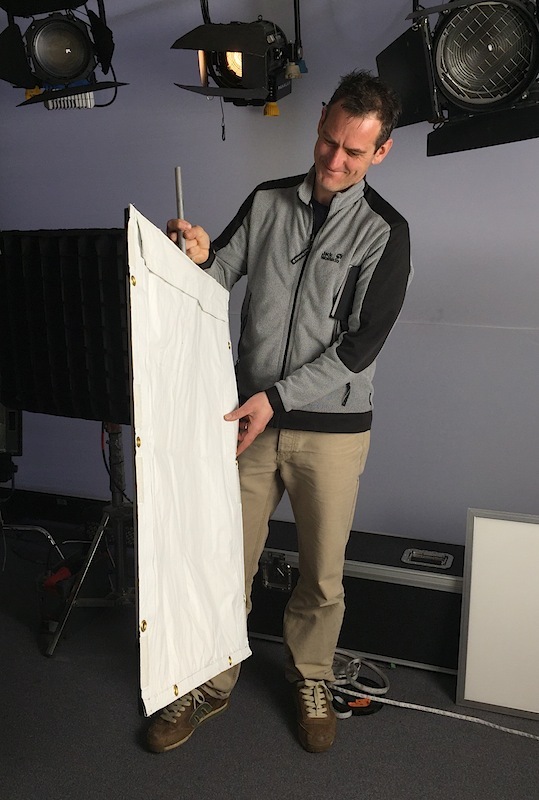 There is only one way to set a lamp: bottom of the stick, no barn doors, any gels in a gel frame and the services of a good rigger to secure it all. The light does change incredibly fast here but at least you know that whatever comes will pass in a few minutes and what came before will return shortly. Here we were able to make good use of the dramatic skies. Even on car interior scenes the fast moving clouds were reflected in the wind screen to good effect. The Goose has come into its own here - finally some proper cold weather to test its mettle. From left to right: Grip Paul Kemp, Camera Operator Rodrigo Gutierrez, myself on B Cam. The one day in the last twenty years when it has been possible to erect at 12x12 with no fear of the the thing being blown away to Norway. It has been postively Mediterranean here and wouldn't you like to think that we are taking advantage of this glorious weather. 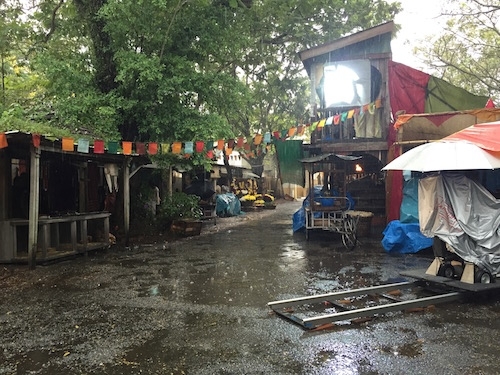 Well think again - the scene takes place in the back of a laundry van. At least the Velvets came in useful. I told you the Velvet was waterproof and gaffer Arthur Donnelly proves the point. 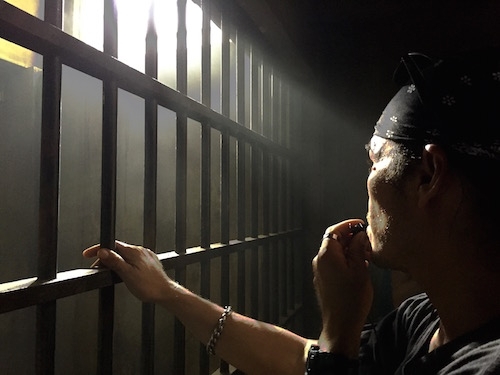 For a shot that required control of the light fitting in the entrance to a ship's galley, best boy Paul Bates replaced the existing bulb with a strip of led Lite Gear Light Ribbons. 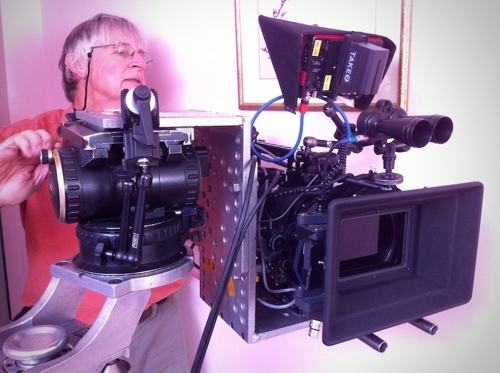 Excellent use of the mini jib in tight spaces. 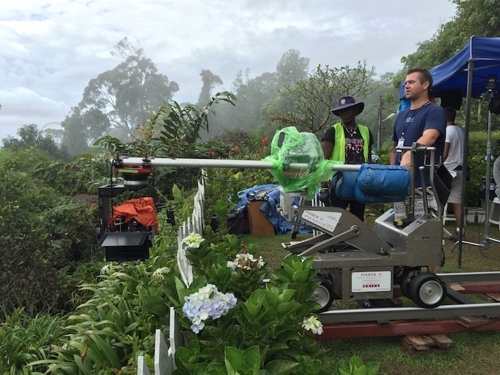 Grip, Paul Kemp, devised a quick way to set up the mini jib and remote controlled Aurora head in the most inaccessible spots. Ace focus puller Andrew 'Mits' M'Itwamwari is adjusting the cine tape. 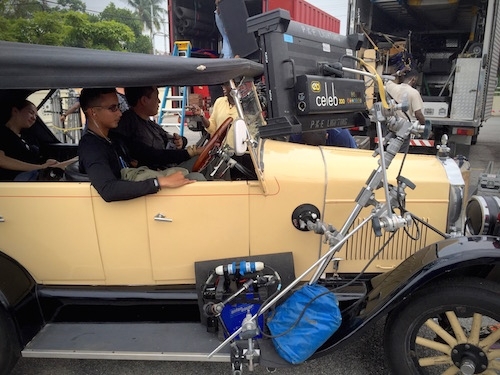 Camera operator Rodrigo Gutierrez is manning the wheels. Poor Roddy is accustomed to plusher surroundings but mucks in willingly and always gets the camera in exactly the right position. 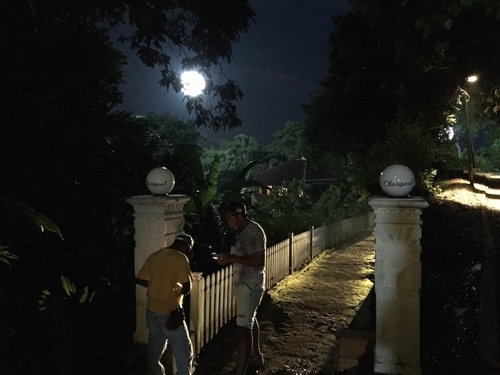 The battery powered LED Velvet light proved its worth on a long walk and talk tracking shot. The character was against a bright white sky the whole time and needed a lot of light to prevent him from becoming a total silhouette. There was not enough room to position conventional lights and a cable run the length of the track was impossible. Two velvets side by side hand held provided enough light to fill the eyes and were easily portable - Arthur might disagree! Oh no! This is taking one's reputation as the ultimate 'Can Do' gaffer a step too far. 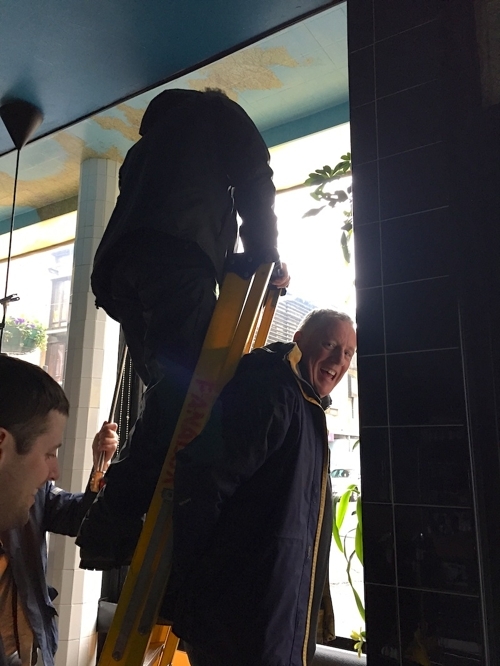 Failing finding a good purchase point for the old 'gin and peppes', gaffer Arthur Donnelly assumes bracing duties whilst his trusty best boy Paul Bates ascends the ladder to derig the lamps. Do they do this all the time! The squalls blow through every half an hour. 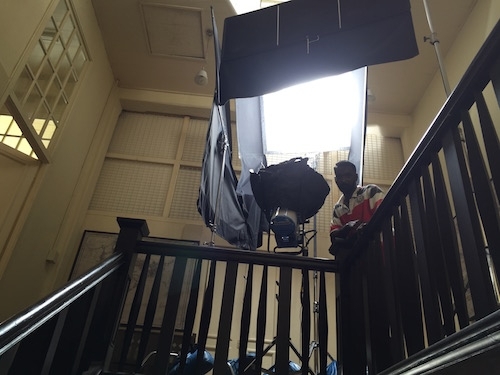 Lighting continuity is for the birds unless you are using the very versatile HiLo. 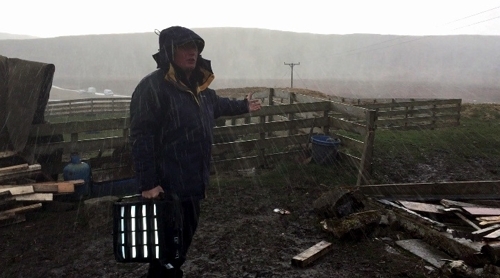 Instant colour temperature and light intensity adjustments make keeping up with the Scottish weather a breeze. From left to right, my very able and tireless Glasgow crew: Genny Op, Mark Ritchie; Gaffer, Arthur Donnelly; Best Boy, Paul Bates. It may not look like much but this is the first day int/ext that I have lit entirely with LED lights. The big round one on the left is a Panalux HiLo, the brighter one in the middle is an Arri L7 and the small one on the right by the car is a battery powered 'The One' Velvet Light. They are all bi-colour, enabling any colour temperature to be dialed in and of course they are all dimmable. The Velvet's added bonus is that it is waterproof - useful in this weather. The creative control is liberating and production is saving a fortune in lighting gels. Diligent camera operator Tony Kay hard at work day and night writing up his notes on the recce bus while I'm dreaming about which fly might entice the wild brownies in Shetland's teeming lochs. Crack first assistant director David Gilchrist is equally engrossed in wrestling an increasingly impossible schedule. 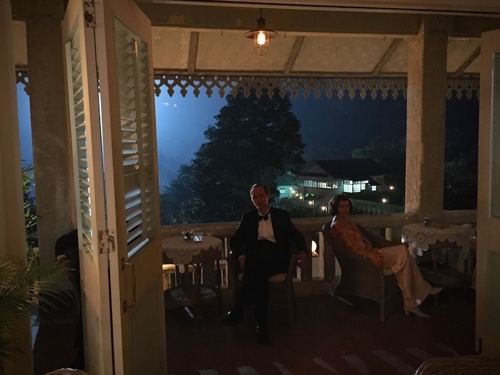 Director Thaddeus O'Sullivan is enjoying the gorgeous view - thankfully someone is. 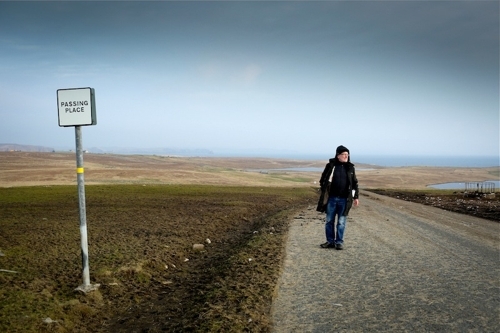 The Shetland landscape is reminiscent of the Burren on the way to the Cliffs of Moher. It could only be a tech recce crew. An army of black North Face clad (except for me in my Canada Goose) film folk discussing the minutiae of shot making and ignoring the beautiful scenery entirely. Who is that and what is he doing? 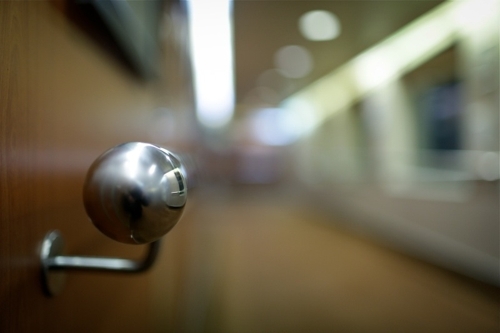 Not another pseudo hipster photographer taking arty photos of a retro chic corridor and experimenting with shallow depth of field. 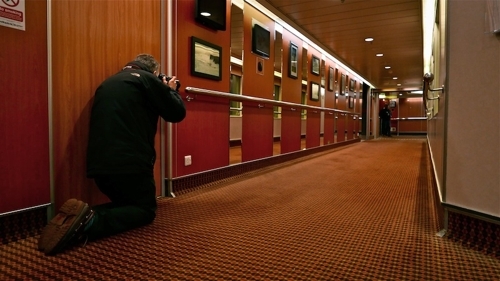 That carpet is enough to make anyone seasick. Sailing out of Aberdeen the 5D mk3 was set to 12,800 asa. I picked up a 35mm F1.4L on ebay recently and this is its first proper outing. Wide open and in conjunction with the high ISO, the light gathering capabilites are incredible. This picture is far far brighter than the human eye can see. This has been the longest set of tech recces ever. One day in Glasgow, overnight ferry crossing from Aberdeen to Lerwick in Shetland, three days recceing Shetland, fly back to the mainland followed by three more days of recces in Glasgow. 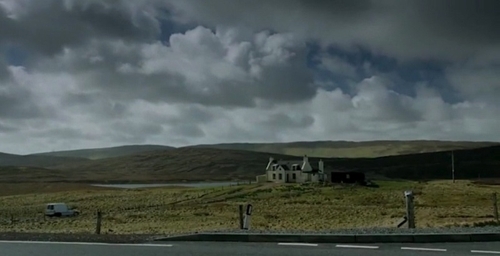 We are all very ready to start filming, you guessed it, Shetland series 3, on Monday. It's not available yet but gaffer Colin Thwaites and I were shown this prototype at Panalux while prepping 'Mum' for Big Talk. An ingenious solution to tight spaces. Can't wait. 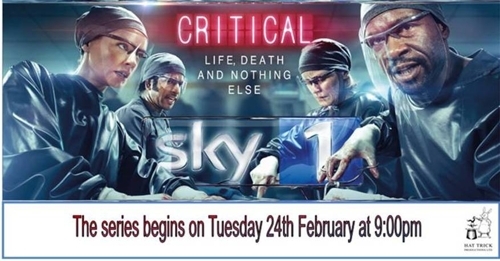 The publicity machine is gearing up in advance of episode 1's transmission on February 24th. Click on the image below for a behind the scenes look at the production. 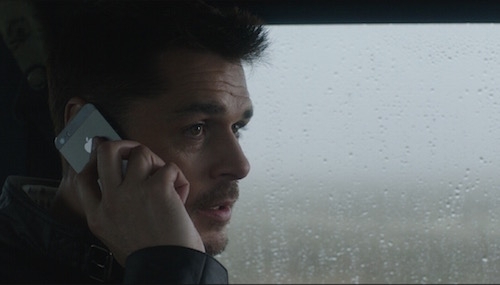 Sadly did not win the BSC award but it could not have gone to a better cinematographer: Tony Miller BSC for Quirke. 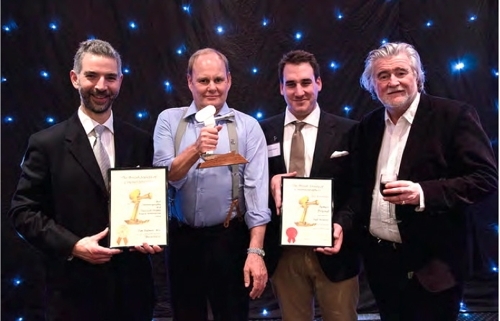 From left to right: Tim Palmer BSC with nominee's certificate, Tony Miller BSC with winner's statuette, James Friend BSC with his new member's certificate (congratulations James) and John de Borman BSC, ex BSC president standing in for Barry Ackroyd BSC on the night. 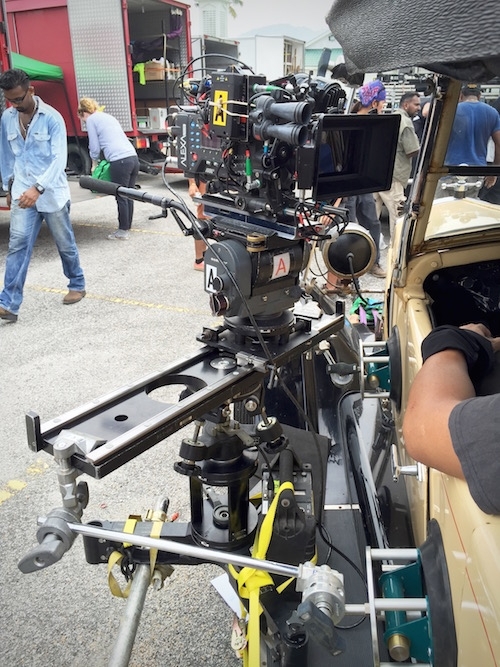 To simulate a drone's pov a 5D Mk3 was mounted on a Steadicam Merlin. It worked surprisingly well with just the right amount of 'nervous' stability. Winter sunrise over Upper Heyford RAF base. Very happy to get the whole Critical gang together for the Guy Jenkin project - here proudly sporting our 'Critical' gilets (sp?) except for Chris Samworth whose jacket is now in the post thanks to this photograph finding its way to the Critical production office. From left to right: B Camera Focus, Chris Samworth; Camera Car Driver, Irish John; myself in silly hat; Camera Trainee, Bi Lau; B Camera Operator, Jon Howard; Grip, Steve Weightman; A Camera Loader, Darren Johnson; Assistant Grip, Ben Lowe. On the aforementioned Guy Jenkin project a large amount of drone footage was scripted. Dean at Aerosight handled all the technical requirements. He supplied different sized aircraft carrying different camera systems depending on the environment that the drone had to fly through. This was the 'workhorse' drone; a larger craft wearing a 4K Lumix G4 and 12mm lens. Much smaller machines with Go Pros were used as well. Couldn't think of what else to call it. It's a dolly for hand held work that you control with your bottom. Used very recently on a program that cannot be named but is Guy Jenkin's new project. The show is mostly hand held and Steve Weightman the grip improvised this method of moving the camera in a more controlled fashion. It works very well for over the shoulder shots when the characters are seated. At the controls on the left is B camera operator, Jon Howard.